Decatur is a community of about 76,000 in Macon County. The Pershing Early Learning Center in northwest Decatur houses 17 half-day prekindergarten classes for at-risk children, 6 half-day inclusive classes, 7 self-contained early childhood special education classes, and a parent-involvement program for children from birth to 3 years old. 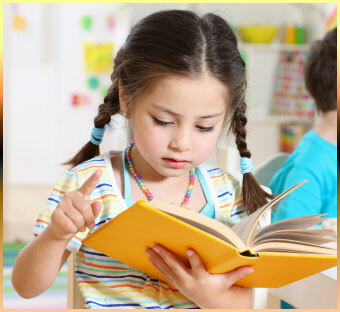 Children often enter the program at age 3 and attend until they reach kindergarten age. The lead teacher in the classroom that participated in the House Project, Laura Deluca, has been teaching prekindergarten for 15 years. Laura and her co-teacher, Sandy, have been working together for 3 years and have implemented many projects with the children. When this project began, the 3- and 4-year-olds in Laura and Sandy’s morning and afternoon classes had already participated in two long projects and a few shorter investigations. The project began in early February and lasted about 2 months. The House Project began when the class was playing with the story The Three Little Pigs. The teachers had recently read different versions of this familiar story and acted it out many times (Figure 1). Figure 1. The class acted out the story of the three little pigs as a group activity first, and then the children continued to act out the story spontaneously. Notice the brick house they are constructing. The children retold the story, and they represented their understanding through drawing. The many ways that they represented their knowledge reflect their interest in the topic (Figures 2-7). Figure 2. A classroom floor puzzle of the story of the three little pigs challenged children to put the story in sequence. An I-TEACHe portfolio sheet documents Carl’s knowledge of the story of the three little pigs. Carl retold the story at circle time for the entire class. This was new social behavior for him. Figure 3 . I-TEACHe portfolio sample reveals the Illinois Early Learning Standards that were met as the children retold the story of the three little pigs on the flannelboard. By Bobbie, age 5 years, 2 mos. By Desiree, age 4 years, 6 mos. The first pig built his house outa’ straw. The second little pig built his house outa’ sticks. The third little pig built his house outa’ bricks. Then the fox blowed down the houses. He couldn’t blow down the brick one. Then he fell down the chimney. Once upon a time there’s three pigs. Little pig, little let me in!!! He blows and blows, then blows the house down. Little pig let me in!!! Where my chinny chin is. Then he blows the house down. Figure 4: Children retold the story of the three little pigs in a variety of ways. Figure 5. Raki (age 5 years, 5 months) drew the three little pigs and their houses. Figure 6. Jonae (age 5 years, 5 months) drew the houses of the three little pigs. Figure 7. Jonae (age 5 years, 5 months) made a spontaneous representation of the three little pigs’ houses. She dictated the labels to her teacher, who recorded them on the drawing. During these story re-telling activities, the children became especially interested in the brick house. Many of them were excited to share that they lived in brick houses. We helped the children think about their own homes, and they dictated ideas for a web about what they knew about houses (Figures 8-10). They also recorded information about their own homes with their families as a homework activity. Figure 8. The teachers helped the children create a topic web during Phase 1. Figure 9. Claire (age 5 years) drew the brick house on a wipe-off board. At the beginning of the project, the children gained basic knowledge about houses. This included learning about types of houses and discovering the features of houses, such as stairs, windows, doors, roofs, and chimneys. It was a time of discovery, vocabulary building, and problem solving for the class. Graphing types of homes—who lives where? Discovering a favorite type of house in the book A House is a House for Me—a tree house! Figure 12. Charity (age 5 years, 2 months) explained, “I helped Brandon (age 5) make a house like mine. It had people and windows.” Laura, the teacher, suggested that they look at the dollhouse carefully and record its features. Figure 13. In his journal, Carl (5 years, 3 months) pointed out the different parts of his house and asked the teacher to label them for him. Figure 14. Jonae’s journal description of her apartment included the yard and the parking lot. She dictated a description to her teacher. Figure 15. The children made a graph to determine if more of us had houses with or without chimneys. Six children’s houses had chimneys, and eight children’s houses did not. Figure 16. Claire (age 5) and Kim (age 5 years, 2 months) built a house with blocks and then sketched it collaboratively. Claire typically played in the art area, and Kim was often found in the block area. This was a new collaboration that combined both areas. Figure 17. The children were eager to make houses. Laura gave them boxes and tools early in the project. Figure 18. Three-year-olds loved to tape! Figure 19. The children added stilts to one of the box houses. This addition reflected their interest in the house on stilts in the book A House Is a House for Me. They called it a tree house. Some of the cardboard houses that the children built included features that they were thinking about, such as windows, roofs, doors, bricks, and even stilts for a tree house. They represented what they knew based on their study of their own homes and the story The Three Little Pigs. However, the teachers noticed that some children seemed more engaged with the use of tape than with representing their understanding of houses. We decided that they might need more focused, firsthand experience to pique their interest. We decided to take a walk through our school neighborhood to observe types of houses and record their features (Figures 20-30). Children signed up to observe various features on our House Hunt. They used tally marks and representational drawings to record and report on their findings. Some tallied colors of houses, and some tallied the number of chimneys, stairs, steps, and garages. Figure 20. The class observed a garage near the school. Figure 21. Children were interested in chimneys. Figure 22. Some of the children tallied observations. Figure 23. Children paused to make field sketches of stairs. Figure 24. Sketching a two-story house was a challenge. Figure 25. Jeremiah used drawings of a two-story house as a way to tally. He sketched a representation for each two-story house that he saw. Figure 26. 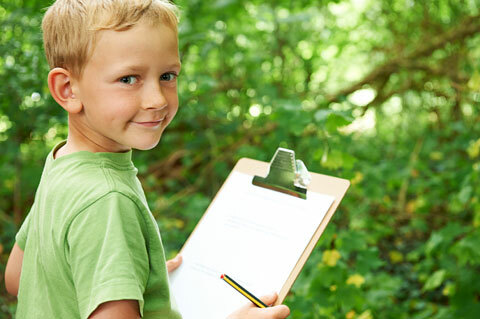 With the teachers’ help, the class compiled a list of what they observed on their walk. Figure 27. Jonae (age 5 years, 5 months) made this Time-1 drawing of a house. Figure 28. Jonae made this Time-2 drawing of houses, following the House Hunt. She said, “These are the houses, and they had dirt. They had windows and doors.” Laura noted that the Time-2 drawing looked more like a neighborhood than the Time-1 drawings, which had been done 2 weeks earlier. Figure 29. Chloe (age 5) said, “This house is made out of brick.” Notice that the drawing included her address. Figure 30. Jeremiah’s (age 5 years, 10 months) drawing included a house, a man, a garage, and a car. The man is in the basement. Children brainstormed a list of all the types of houses that could be made. A committee narrowed the choices of the kind of house to build to three. The morning and afternoon classes voted to make a final choice. The morning and afternoon classes used the computer to investigate house plans. The children provided input on window placement, doors, etc. All the children helped to create (and then play in) the Pet Hotel. Figure 31. The children voted to determine the type of building to construct. Figure 32. Children inside the brick Pet Hotel pretended to do further construction. Figure 33. The teacher helped the children put shingles on the “brick” Pet Hotel. Figure 34. We proudly displayed our project on houses in the main entry of our school. Laura’s reflections: I am pleased with the level of representation that this class has reached. This group of mostly inexperienced 3- and 4-year-old at-risk preschoolers has grown so much this year over the course of two longer projects and a few shorter investigations. We have been teaching investigation skills and working to establish a sense of wonder in the children, but during the House Project, we felt that most of the children were truly on their way to being real investigators! This topic was a meaningful one to the children because it took place during a time of seasonal transition when they heard many discussions about weather and shelter. I am learning to allow them more time to experience concepts firsthand. For example, it was a good idea to go back and re-experience the topic through our house walk. The walk sparked a renewed interest and gave the children new ideas to represent, such as two story and garage. I believe that children in my class met a majority of the Illinois Early Learning Standards, built vocabulary skills, developed a sense of wonder, and experienced meaningful uses for basic skills, like writing, reading, counting, and problem solving.